I wore this look a couple weeks back when my mom was in town! For a couple days Dallas experienced legitimate sweater weather, with the temps in the high 50’s and low 60’s. It was amazing! Needless to say, I was eager to pull out and sport a few of my new purchases for the fall/winter season before the temps rose again. The first of those items? This split-sleeve sweater I found for under $70 at Nordstrom! 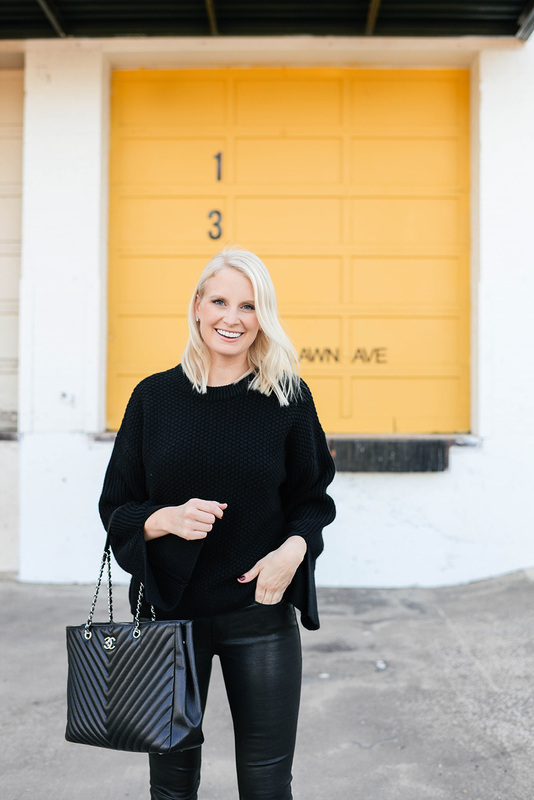 The overall look of this sweater is simple (which I love! ), but it features a chic touch with slits at both cuffs that make the sweater anything but basic. It’s one of those wear forever kind of sweaters – there’s really nothing super trendy about it, so I know I’ll be using this one year after year. These leather leggings were actually a sale find at the Theory outlet in Carlsbad this summer! The same style is available full-price online, but I was able to snag them for $350 less. Still not budget-friendly, but leather is always a worthwhile investment… don’t you think? What I love about these is they’re styled like jeans, with a button closure and pockets. If you’re looking for less expensive alternatives to the ones I’m wearing, try this pair and this pair. I also got these to tuck into boots this fall and they’re so comfy! Love the high-rise waist and the fact that they’re under $100. Last but certainly not least, I have received SO many compliments on these boots (more sizes here and here)! When I first saw them I knew I wanted them, but truth be told I wasn’t sure I could pull them off. They’re a little wild and I was concerned a printed shoe wouldn’t be super versatile. Boy, was I wrong. These babies look good with so many things! In addition to wearing them with all my favorite leggings, I’m excited to style them with skirts and dresses. The pointed toe elongates the legs, and the higher shaft makes tucking in pants a breeze. In addition to the unique cheetah-inspired print, the floating block heel adds some edge and interest to the look. So cool! I wore them around all day long as my mom and I shopped around Dallas, and they were super comfortable. If the print is not for you, these boots also come in solid black leather! These boots are simply amazing, love this look. How’s the fit of the boots [ true to sz.?] ? They were true to size for me! I got a 40 and wear a 9 1/2. Hope this helps! The heel is high, but the arch isn’t super steep. I wear heels pretty often and these are very comfortable in comparison… BUT if you don’t wear heels much, these might not be for you!